Additionally, a stationary pizza oven isn’t going to be great unless you plan on staying in the same house for an extended period of time (so, that’s a no-go for anybody renting). After all, you don’t want to put in all the time and effort to build a pizza oven, just to find that you have to leave it behind or take it apart when you move. There are also the financial and time components to consider. 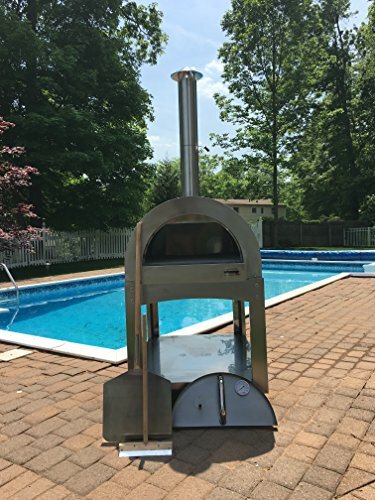 If you plan to buy this type of pizza oven outright or pay someone to build or assemble one, the cost can be very high. In many cases, you may be looking at close to (or above) $1,000. You can save money by building your own and some estimates suggest you can do so for just a few hundred dollars. But, even if you can find good instructions and inexpensive materials, the time factor is considerable. For people who work full-time or who aren’t experts with their hands, this can be a pretty daunting task. Is it worth it? Without a doubt. But, this type of pizza oven simply won’t be the perfect choice for every situation and it is a serious investment. Besides that, many of the other styles of pizza oven still let you have great pizza, without the same financial, time and space-based challenges. If this type of oven is practical for you, by all means, go for it. If not, read on for some alternatives. The next type of style is mobile pizza ovens. Now, for this purpose, we’re specifically focusing on outdoor models, ones that don’t rely on an external heat source (such as a gas line from the house) There are also pizza ovens that are great for countertop indoors but that is a topic for another time. Typically, this type of pizza oven is made of metal, rather than brick. Some rely on gas from a propane tank, while others use wood. The reliance of metal does offer a range of advantages. For example, it allows for the use of convection motors and may even rotate the pizza stone. Besides that, any brick oven is going to be heavy and that alone is a poor choice for anything portable. 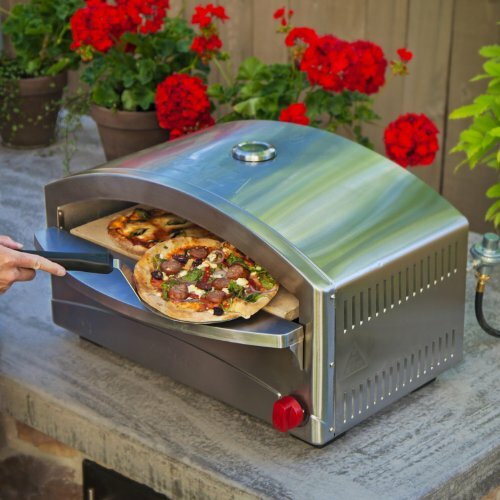 There are both wood burning and gas mobile pizza ovens for your backyard. Ovens that don’t use wood are often easier to work with and still create great pizza, even though they don’t have that same smoky wood taste. They get to cooking temp faster, and maintain it more reliably. One example of this is the model below, which comes from the brand Black Stone and it does offer a range of extra features. In theory, these should decrease the risk of burning your pizza, while also increasing the speed of cooking. The cart can also be separated from this pizza oven, giving you the ability to set it on top of a barbecue island or something similar. However, the product is gas based, so it isn’t wood fire cooking in the traditional sense. 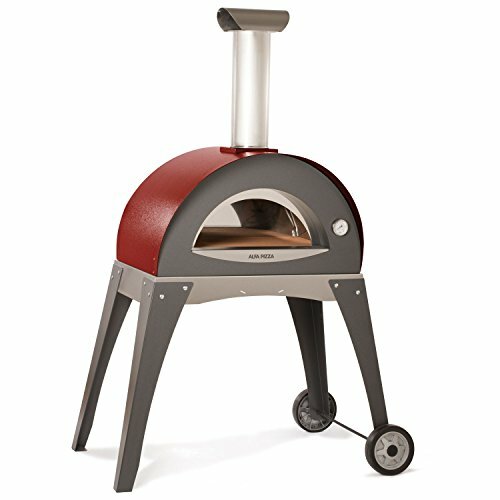 On the other hand, you have products like the one below from ilFornino, which truly are wood-fire pizza ovens. So, you’re getting the same type of power as you would from a brick oven but you have something that is more mobile overall. The style also means that you could do other types of wood fire cooking without any problems at all. 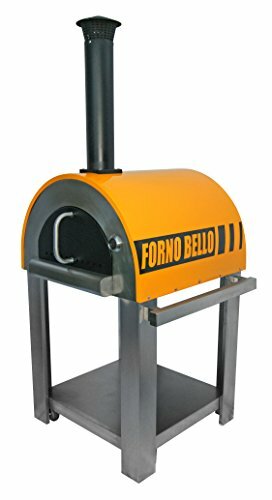 Actually, my favorite brand that makes a mobile wood-fired oven is called Forno Bello. They make a beautiful oven that no other brand can compete with in my opinion. The one shown below is yellow, but they also make a red one. This is my dream oven! Hover over the image for current pricing (click on mobile). Western Pacific also has a solid pizza oven that uses a wood fire approach. The general design seems to work well and the cost is about normal for this type of woodfire oven. Personally, I can imagine the oven being incredibly fun to use for pizza and for other dishes. Still, the price point may be more than many people are comfortable with. Another example is the La Hacienda brand, which has a pizza oven/smoker combination. This is considerably smaller than the ilFornino model and it doesn’t fare as well in reviews. However, the saving grace is the price. In most cases, wood fired outdoor pizza ovens are expensive, regardless of whether they are mobile or not. This one is an exception to the rule and is just a fraction of the price. While this may mean that the quality is lower as well, the product is still interesting if you don’t want to spend a large amount of money. An unusual style that is also on the market is this one, from Forno Chio. Visually, this model looks different than the rest and the oven is also fairly low, which could be useful or a pain. But, despite being small, this model is one of the more expensive options for a mobile outdoor pizza oven. For this reason alone, it probably won’t be the best fit for most people. There are many other brands out there as well, along with variations on the overall style. On average though, this type of outdoor pizza oven does end up being relatively expensive, particularly if you want a wood burning version. Likewise, there is often that familiar tradeoff between price and quality. These mobile options are great for people who are limited in space but still want the traditional pizza making experience. Additionally, they give you the ability to take your pizza oven with you if you move to a new house. Still, most aren’t extremely portable. So, it probably wouldn’t be practical to take the product to a mate’s place or out camping. Plus, if you have a wood fire option, you may not want to anyway. There is considerable variation among these models and what they offer. So, how well they work will strongly depend on what you need. For example, some of these are still fairly expensive but they offer the same benefits that a stationary pizza oven would. Others are cheaper but may be lower quality or may be gas-based rather than a wood fire oven. The previous two types of pizza oven are specifically focused on home use. But, some people are interested in going beyond that idea. After all, if you are a natural at making high-quality homemade pizzas, why not try to make some money in doing so? Now, there are many different variations for doing just this. Some people simply choose to take advantage of one of the mobile pizza ovens from the section above, typically one that is a wood fire option, rather than gas. But, such products aren’t really designed to be moved frequently and they don’t work well in that role. On the other hand, truly portable pizza ovens (like those used for camping) don’t have the power needed for commercial pizza cooking. The alternative is to turn to brands that specifically focus on pizza ovens for a mobile business. Now, you won’t typically find these products on Amazon but the companies are around. For example, one brand is Forno Bravo, which creates mobile pizza ovens for exactly this purpose. The products they create are impressive, typically involving a brick pizza oven on a trailer. By doing so, you do end up with something extremely portable that is also very practical. Plus, because the company specializes in the area, their designs take into account important considerations like structural strength, fire extinguishers and hygiene. There are also companies like Forza Forni that produce more comprehensive pizza trailers. In this case, you end up with an all-in-one setup that allows you to do everything, not just cook pizza. There are other companies out there that do similar things but you’re generally looking at one of these two approaches. In most cases, what you end up with would be customized to your own individual needs. As a result, no two products are ever completely alike. The idea can work well but, as you can probably guess, there is considerable cost involved. Most companies don’t offer examples up front but you’re likely to be paying much more for this type of product than you would for a conventional pizza oven. Needless to say, this type of pizza oven is only going to suit a very specific audience. After all, pizza ovens like this aren’t really tailored to backyard use or to camping either. However, if you are interested in starting a business in this way, the appeal is easy to see. One of the simplest ways to get your own pizza oven is to take advantage of what you already have, your barbecue. After all, why invest in an entirely different device when you already have something at home that does some of the same functions? In theory, you can actually cook your pizza on the grill directly and some people do this. I’ve even tried it myself and the results come out fairly decent. Nevertheless, the end results may not be what you’re looking for, especially as the grill won’t reach beyond 500°F or so. 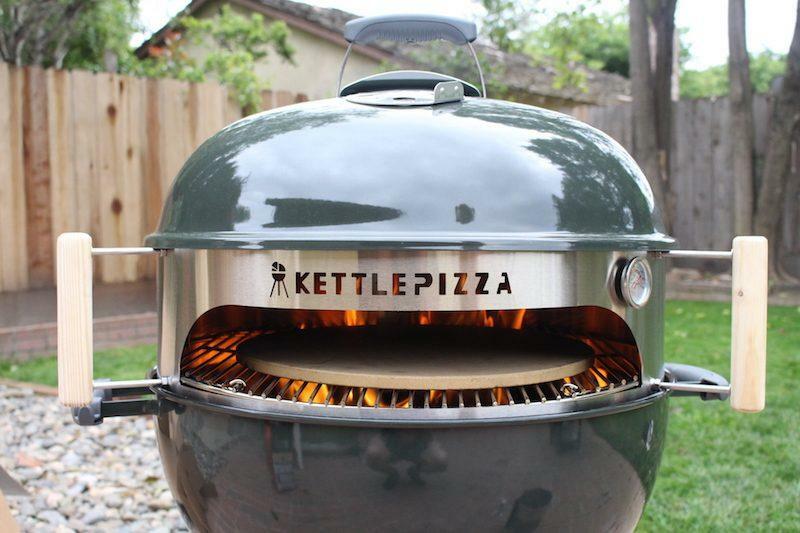 Besides, on its own, your grill isn’t actually a pizza oven. But, there are some different ways to make your gas grill more like a pizza oven, which you can mostly do with tools from around the home. There are also some products out there that can help convert a gas or a charcoal barbecue into a pizza oven, like the ones below. This product is one of the most powerful ways to get the best of both worlds. 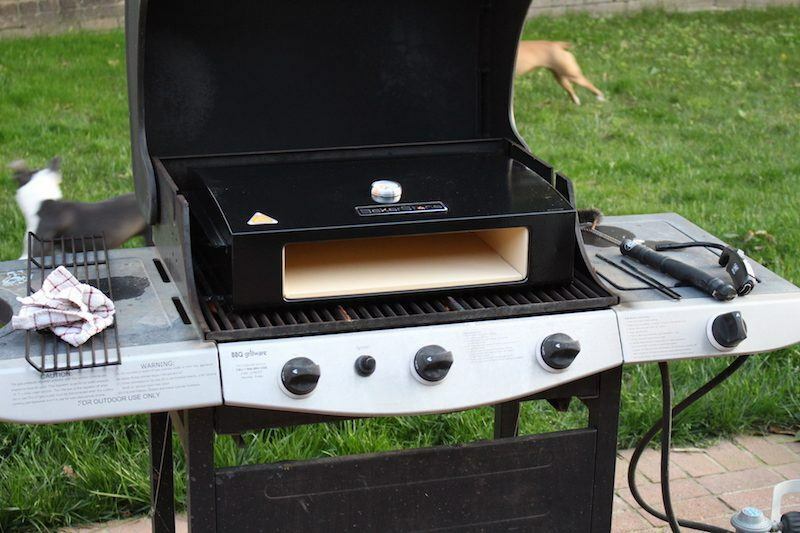 The box literally just sits on top of the barbecue, which also makes it exceptionally easy to use. What’s more, there are no technical skills involved in setting the device up and you don’t need any previous experience. I’ve done a full-length review of the product in the past if you want more information. Alternatively, you could just buy it from Amazon directly. But, I do want to highlight some of the key features here. First of all, the pizza box goes up to around 750°F, which is considerably higher than your barbecue could ever reach on its own. This is because the entire box is made out of pizza stone. 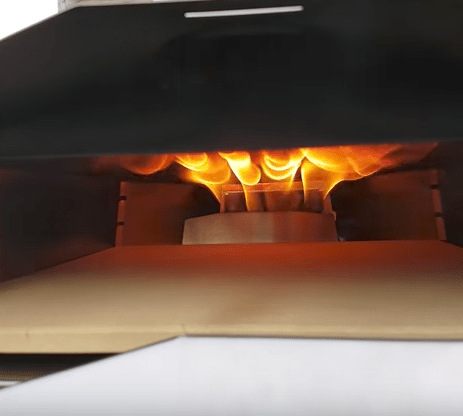 The pizza box itself fits onto any 3-burner gas grill, regardless of the brand. 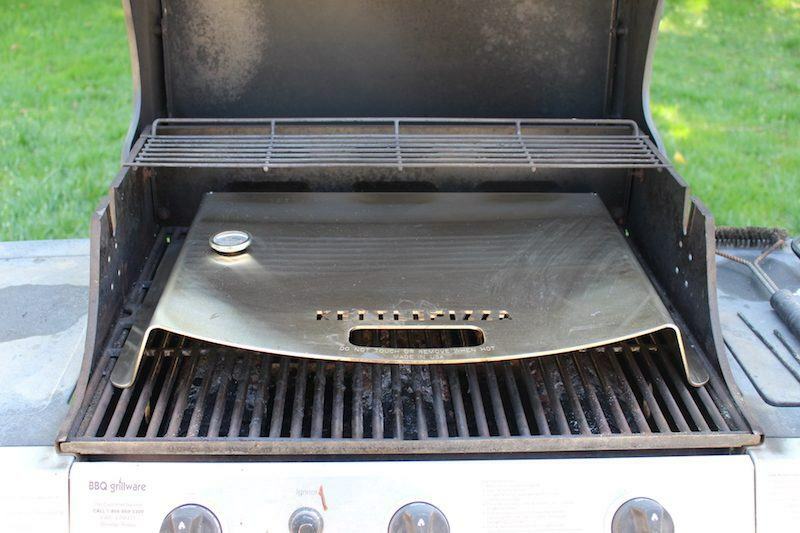 That type of grill is fairly standard, so there’s a good chance that you have one that you could use the pizza box on. The main disadvantage is that this isn’t a wood fire pizza oven, so you don’t get the same smoky taste. However, that is true for many of the options on this list. On a side note, the nature of the box does make it somewhat difficult to clean and it takes a little time to get used to maneuvering your pizza into it effectively. 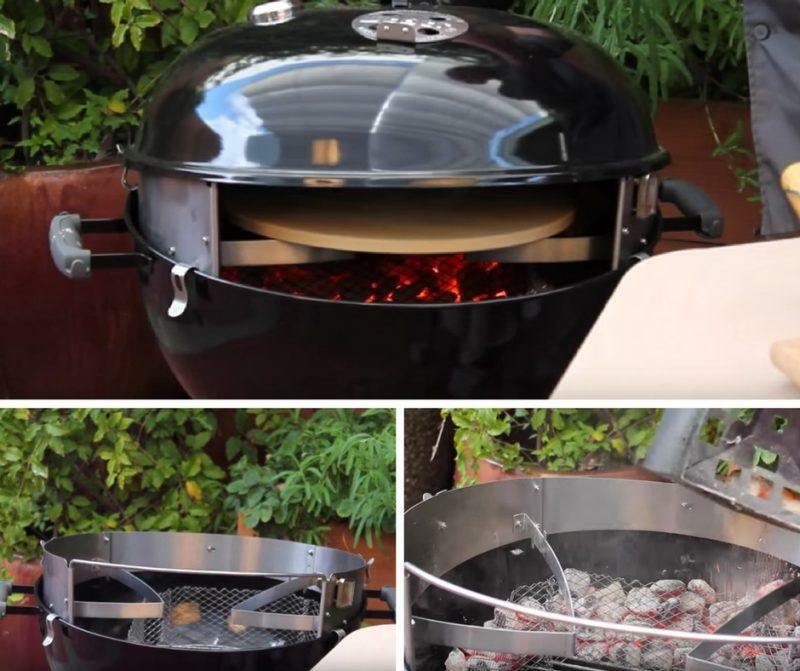 This is another interesting tool that lets you convert your barbecue to a pizza oven. This time, it is considerably simpler, although it is still designed for a 3-burner gas grill. Again, you can check out the full review for more information or buy the device directly from Amazon. With this product, you’ve basically got a hood that sits over your grill, along with a pizza stone. There is also a temperature gauge, letting you keep an eye on how hot the oven gets. But, don’t let the simplicity fool you, this is actually a very effective device. In fact, it’s one of my favorite options. For one thing, the KettlePizza Gas Pro is incredibly fast. It lets you hit upwards of 700°F in 20 minutes or less. This also means that your pizzas cook fast, which is critical for getting amazing artisan results. There are other products out there as well that help you convert a gas grill to a pizza oven and the general principle behind them is much the same. The overall style may have its limitations but it is extremely practical and would be perfect for many situations. All of the barbecue conversion products so far are specifically designed for gas barbecues, typically those that have at least 3 burners. 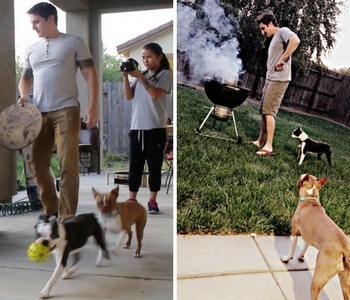 However, not everybody will have a barbecue like that, which is where charcoal conversion options come in. There are multiple different products out there that let you make this conversion. One of them comes from the KettlePizza company from above and is specifically designed for Weber grills (check out the full review of the insert). I tried this one out myself and I did find that it works well – although there is a much steeper learning curve with this product than with gas barbecue conversions. Likewise, the whole design is a little more frustrating. Then again, that’s hardly surprising, when you consider that you have to deal with charcoal, which includes making sure it burns well and is in the right place. There are two main alternatives to the KettlePizza product. One is from PizzaCraft, which is their PizzaQue kit. This has the advantage of being less expensive and uses a charcoal fence that should reduce the risk of cracking your pizza stone (in theory). But, the overall design isn’t as good and the product has some major flaws. The other option is the OnlyFire kit. This one is more expensive than PizzaCraft’s option and doesn’t have an amazing design. With that in mind, I’d recommend going with the PizzaCraft one if you want to save money and the KettlePizza model if you want the best experience. Regardless, the general idea is the same and you do end up with a semi-portable pizza oven that can work well. While they do take a while to get used to, this type of pizza oven can be effective. One final thing to note is that, unlike the gas barbecue conversions, these pizza ovens do actually use flame, so you get some of that smoky flavor associated with woodfire cooking. That is a great outcome, especially as you do also need to use some wood to make the cooking hot enough. However, do be aware that the flavor isn’t quite the same. 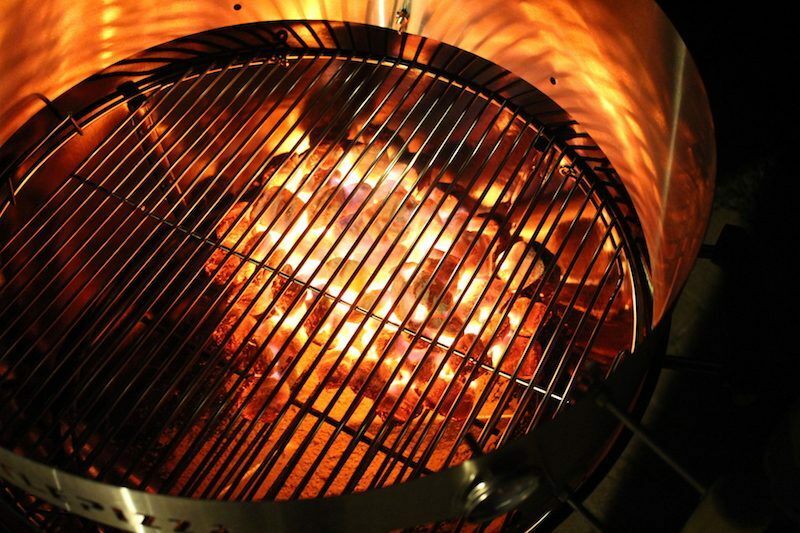 After all, you are using a combination of charcoal and wood, which is different than a wood fire oven. For most people though, the flavor would probably be close enough, especially if a traditional woodfire oven isn’t an option. A barbecue conversion pizza oven is never going to be as authentic as an actual wood fire pizza oven. Even with the charcoal option, the flavors you get aren’t quite the same (after all, the fuel source is different). Additionally, this type of pizza oven is just designed for cooking pizza. If this is all you want, then it probably isn’t an issue. However, wood fire pizza ovens can be used to cook a range of different dishes and many people use them in that way. For the most part, doing so simply isn’t achievable with a barbecue conversion pizza oven, partly because they are on the small side. However, this overall style is still a great compromise for many people – including myself. With this type of pizza oven, you do get most of the benefits of owning your own pizza oven, including the ability to cook quickly at a high heat. In most cases, you will also still be using a pizza stone and a peel, so the experience itself is fairly authentic, even if it isn’t perfect. At the same time, this style is generally inexpensive compared to an actual pizza oven. Likewise, you have considerable flexibility. After all, you could even keep the pizza oven and replace the grill, if you needed to. The end result is that your pizzas aren’t entirely authentic, nor is your experience. But, you can still create some amazing pizzas, such as the ones in the image below, which were made with the KettlePizza Gas Pro. And honestly, unless you are a perfectionist or are devoted to wood fire cooking, this style really is close enough. By far, camping pizza ovens are the most portable option for making your own pizza. And, it’s easy to see how this could be useful. Wouldn’t it be amazing to make your own pizzas while tailgating or at a friend’s place? What about while camping? Doing so is a great way to kick the whole experience up a notch, especially when combined with a few beers. As you can probably guess, there are relatively few portable pizza ovens out there but there are still some interesting products to choose from. 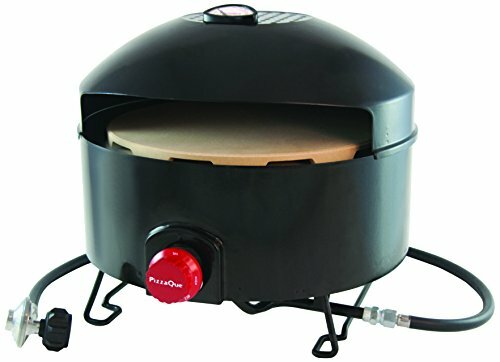 As I mentioned previously, there are various products for converting a charcoal barbecue into a pizza oven, including the KettlePizza Weber Grill Insert. In many ways, this is the most practical approach for a camping pizza oven. After all, a charcoal barbecue is already fairly portable and this is the barbecue of choice for many people tailgating or camping. And, once you get familiar with using it, this type of product can produce some amazing pizzas. 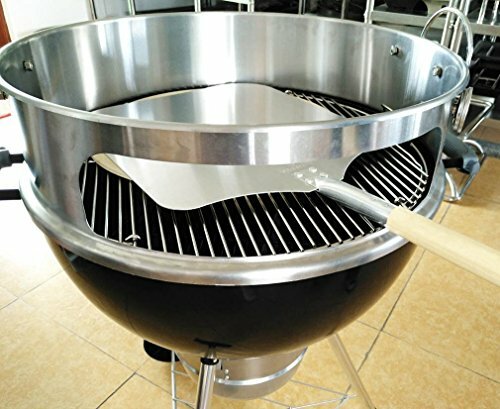 I’m talking about charcoal barbecues because 3-burner barbecues typically aren’t portable and most gas conversion products won’t fit on anything smaller. But, there are exceptions to that rule. For example, the brand Camp Chef specializes in portable cooking options and this includes some products that are focused on pizza cooking. In particular, the company offers a pizza oven that is designed to be used with their portable gas grills. 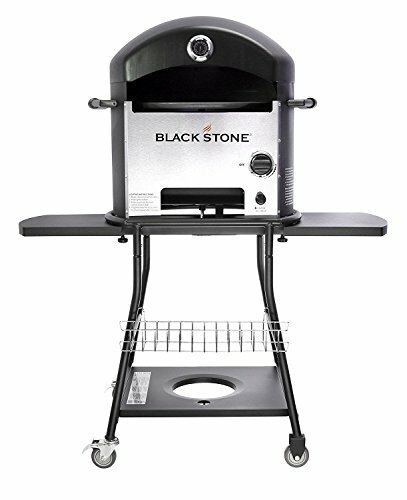 This makes it a viable option if you want a camping pizza oven, especially if you already rely on a Camp Chef grill. But, there aren’t many products out there that work like this, so your options are pretty limited if you want to convert your portable gas grill into a pizza oven. The main other option is a standalone portable pizza oven. This type of design is fairly uncommon but it does exist. The main example is the Camp Chef Italia Artisan Pizza Oven. While it comes from the same brand as what I mentioned above, this isn’t an accessory, it’s a standalone product. 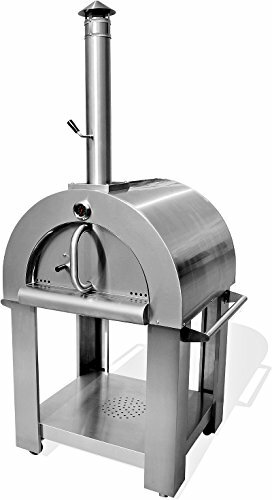 Basically, it connects to a portable propane tank and uses this to fuel the pizza cooking. You can run the oven for a few hours on just a small Coleman gas can, so the potential is easy to see. PizzaCraft also has a similar product, which also uses propane for fuel. This one also has an additional leg kit that you can choose, which basically means you end up with a product that stands at normal height. Alternatively, you can use it on a table without the leg kit. I'm glad you made it to the end of this list, because I saved the best for last. Although this type of oven is not exclusively for “camping”, it's the most portable, and still maintains a wood-fired element. It's called the Uuni, and it's my favorite stand-alone portable outdoor pizza oven (that doesn't have a prerequisite of owning a barbecue like KettlePizza). You can see the Uuni in action below. To create fire, you don't need actual wood chunks – you use wood pellets. They burn fast and hot, getting up to 930º in a matter of minutes. Plus, you get to bake pizza on a legit pizza stone as part of the oven! This would look great on a patio table, or any kind of structure you have in your backyard. You could even take it to the park, or load it in the back of your truck for a camping trip. ==> Get The Uuni Here! Camping pizza ovens are meant to be portable, so the tend to lack the power of true wood fired ovens, or the KettlePizza gas option which has 3 simultaneous gas burners going. But they do the trick for making pizza on the go. 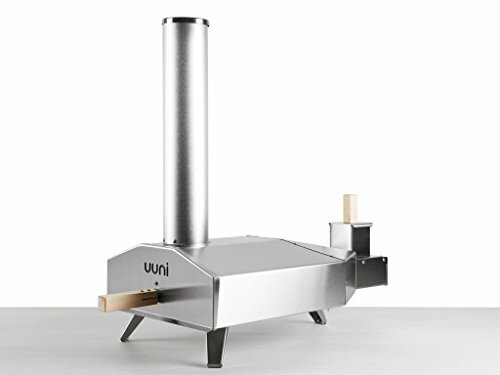 The Uuni is quite powerful, but you could argue that it's less portable because of it's shape. Another option for basic making pizza while camping is making pizza in dutch oven! All of these different outdoor pizza ovens have one thing in common, they can produce amazing pizzas. Even the simplest and least expensive products still make much better pizza than anything you could make in a conventional oven. At the same time, they do all let you have fun with making artisan pizza at you own home, in your backyard. With that in mind, the best option is going to depend strongly on your situation and needs. Without a doubt, a full wood fire pizza oven would produce the best pizzas and is great for other types of cooking as well. But, for many of us, a portable product or a barbecue conversion offers more than enough advantages, without the high price tag. Not ready to move outdoors yet? You can get some pretty inexpensive and fun products for making pizza indoors, even if you don't have a conventional oven. These can still be fun for pizza night! Thanks for explaining the different types of pizza ovens and how it’s important to choose the style first so that you can get the right option. When choosing a style, it would probably be a good idea to first set a budget and then figure out where you will put it. This could help you narrow down the options and ensure that you’ll be able to fit your pizza oven in your yard. Another consideration would be the fuel, such as if it’s a wood fired pizza oven or if it runs on electricity, so that you can ensure you’re able to keep it well stocked in order to power it whenever you want to use it.